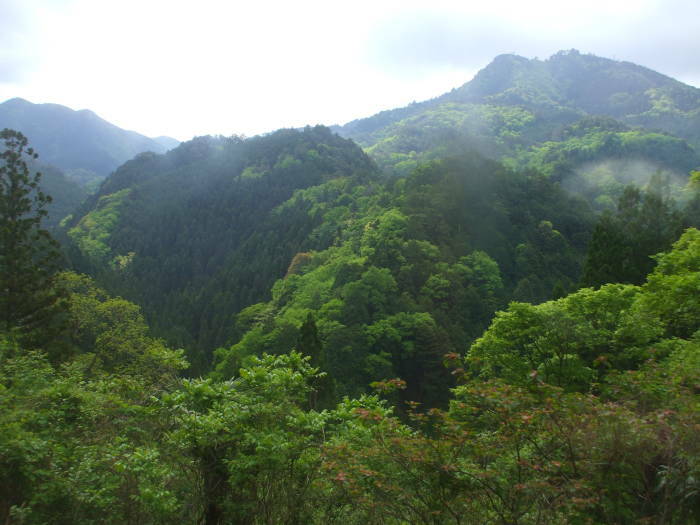 Mount Kōya or Kōya-san is a Buddhist temple complex in a high mountain valley south of Osaka on the Kii peninsula. 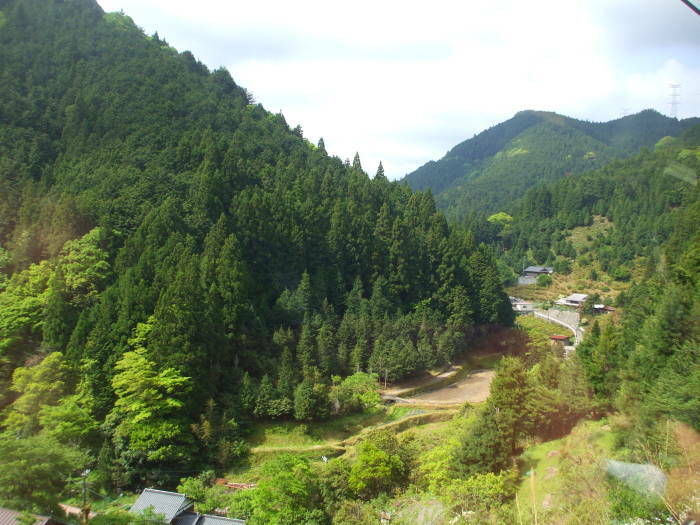 The valley is at about 800 meters elevation, surrounded by eight peaks. The valley and those eight peaks are thought to resemble a lotus blossom, making this an especially auspicious location. The original monastery was founded by the monk Kūkai in 819 CE. It's the world headquarters of the esoteric Shingon sect of Buddhism. Now there are 120 temples in the valley, 52 of which offer lodging to pilgrims. The Okunoin, Kūkai's mausoleum, is in the largest graveyard in Japan. 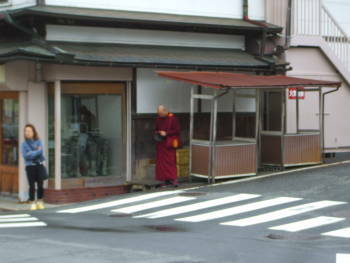 A monk checks his smart phone in Kōya-san. 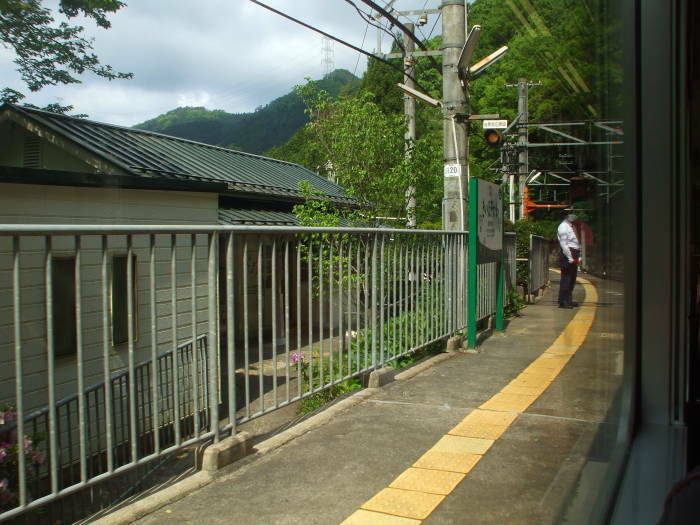 You can reach Kōya-san by train from Osaka, by way of Hashimoto. 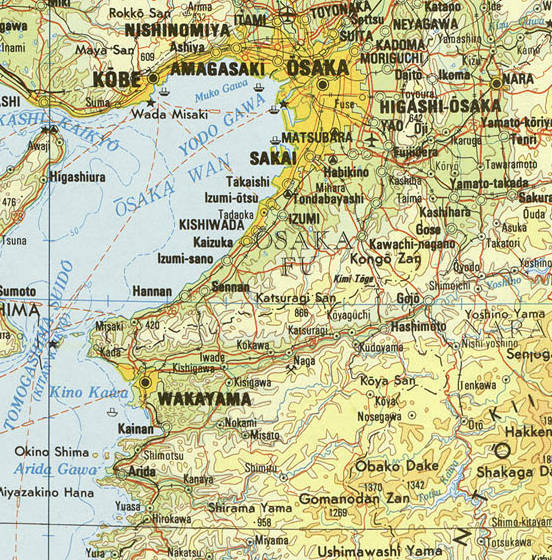 These maps of Japan from the University of Texas' Perry-Castañeda Map Collection show Osaka, Hashimoto, and then Kōya-san. In Osaka you need to leave from Osaka Namba Station. One ticket on the Nankai Electric Railway can get you all the way there via one or more conventional trains plus a cable car for the last leg. 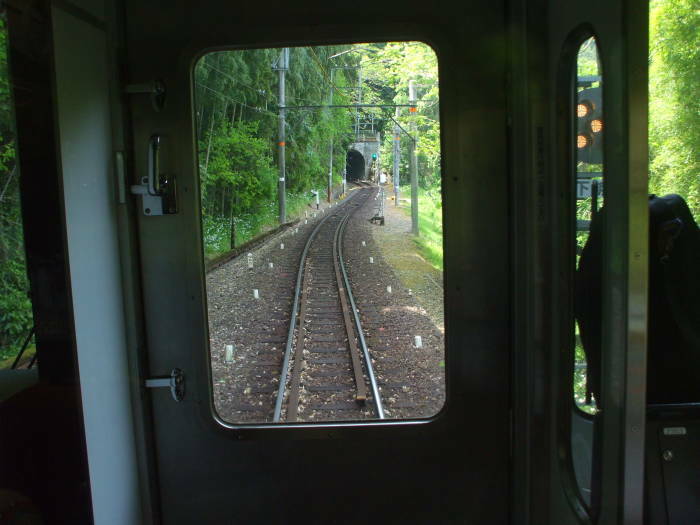 You very likely will need to change to a smaller train in Hashimoto. From Hashimoto it's 19.8 kilometers to Gokurakubashi Station, climbing from 92 meters to 535 meters elevation along the way. You stop briefly at several stations, which get progressively smaller as you ascend. 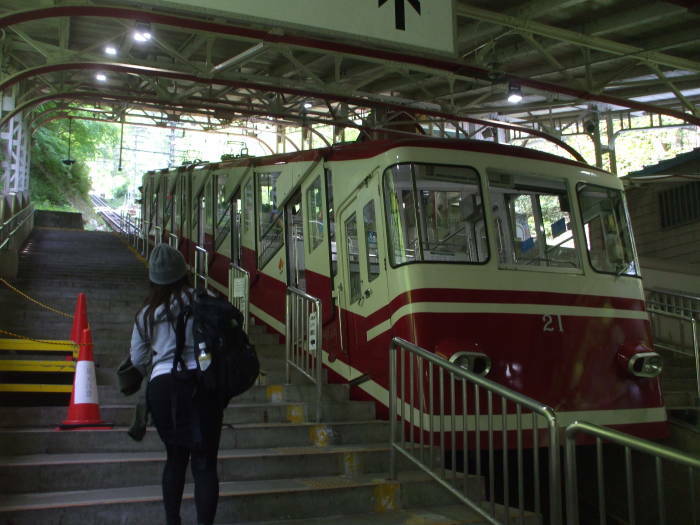 At Gokurakubashi Station you transfer to a cable car. 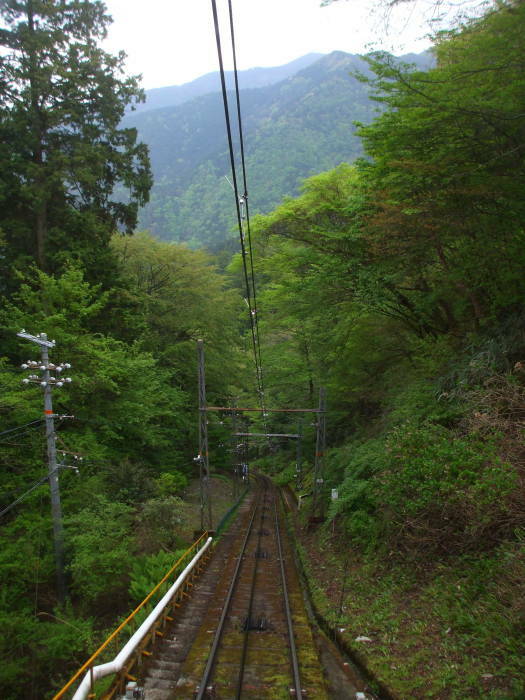 That is, a very steep railway where cables move the cars. 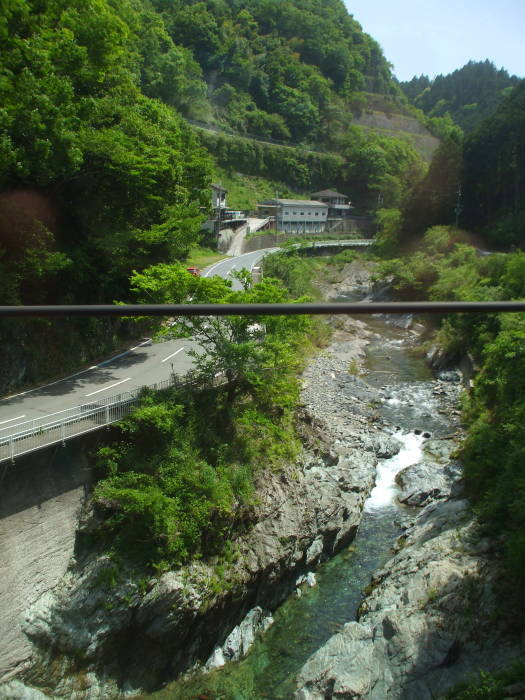 Capsules suspended from elevated cables are called ropeways in Japan. The cable car ascends the final 328 meters to the upper station, at an elevation of 867 meters. 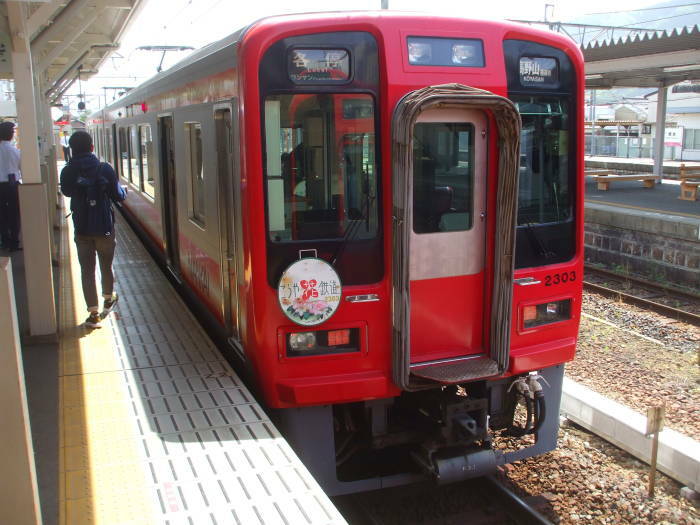 It takes about two hours to travel from Osaka Namba Station to the top of the cable car, about 1.5 hours if you take an express train making fewer stops between Osaka and Hashimoto. 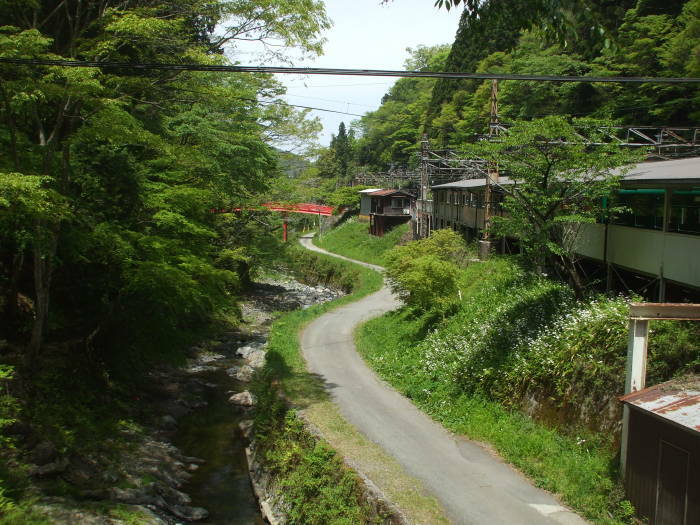 Kōyasan chōishi-michi is the traditional pilgrimage route up the mountain. Some people walk up from the bottom of the cable car line. Others walk much further, starting back down near the river valley near Hashimoto. At the top of the cable car you transfer onto a bus into town. Here is the main intersection at the middle of town. The main temple complexes are a short distance to the right, to the west, and the large cemetery is to the left. 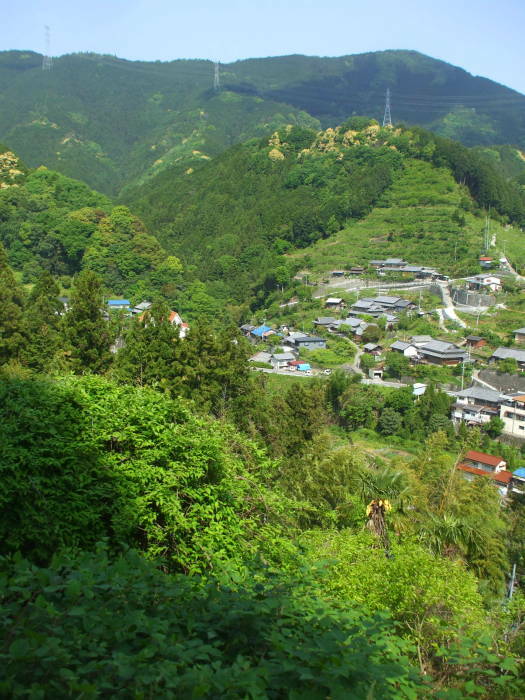 About seven thousand people live in Kōya-san, and almost half of them are monks. 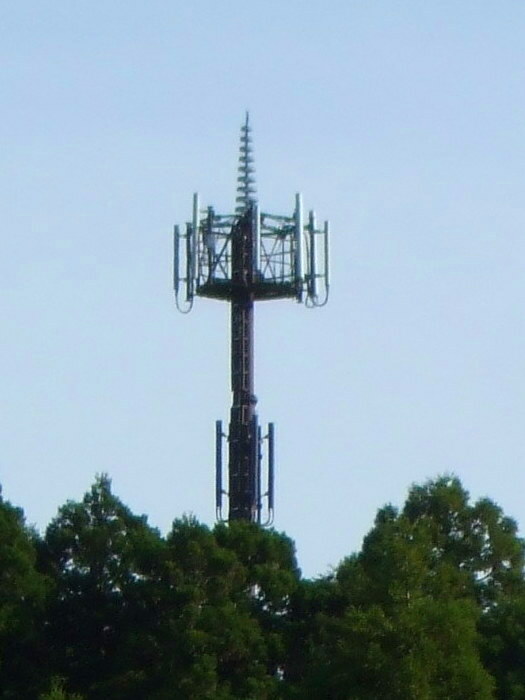 Up on the nearby ridgeline, a cell phone tower is topped with a spire like the sōrin at the top of a stupa or pagoda. I stayed at the excellent Kokuu Koyasan Guest House, along the main road on the east edge of town, just past the enormous Okunoin cemetery. It's at 49-43 Itogun Koyacho Kōyasan, +81-(0)736-26-7216, koyasanguesthouse.com. 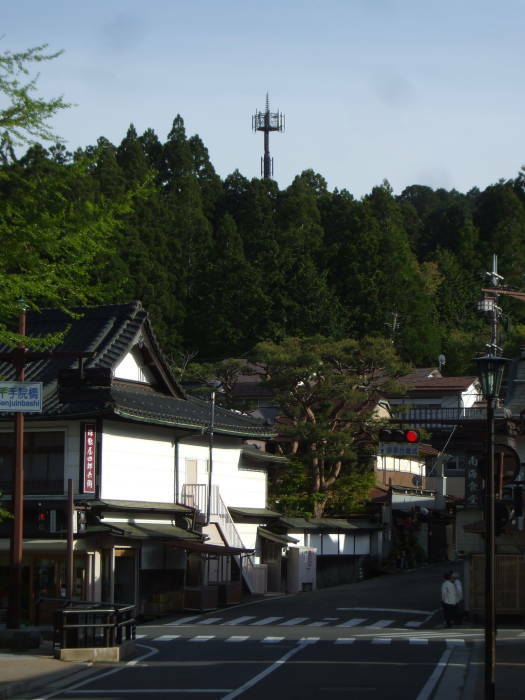 Take the bus through town to the last stop to the east, across from the eastern entrance to Okunoin. Cross to the north side of the road and walk west, past the information office and about another 150 meters. The guesthouse has very nice breakfast and dinner. Kōya-san is very quiet, there aren't many places to get breakfast or dinner. There are now two convenience stores, they had only opened soon before I visited. The Rough Guide edition published in late 2014 reported that the first one had recently opened. Get a multi-site pass at one of the information offices. The pass lets you visit six of the major sites that otherwise would require a more expensive collection of tickets. 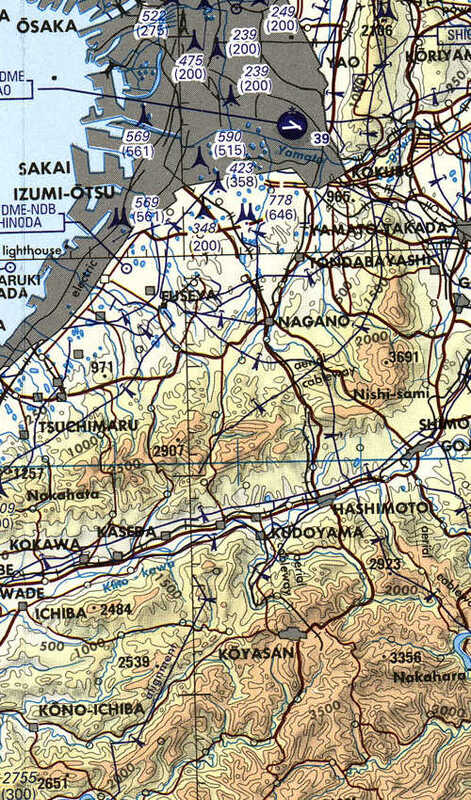 The Hondo at Garan and the Reihokan Museum are two of the sites. Others include the Jukai ceremony, the Tokugawa Mausoleum, and the main hall at Kongōbu-ji.